A recent study titled: “The Contribution of Multilingualism to Creativity,” has proven there are many benefits for the brain gained through learning an additional language. 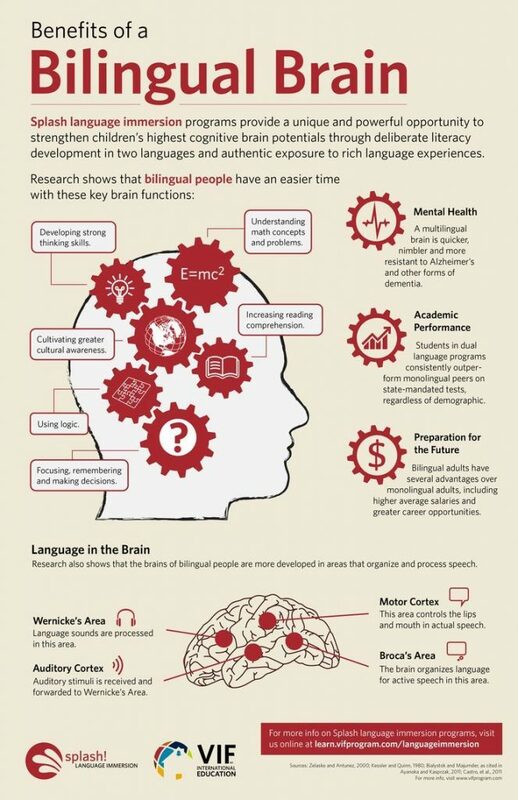 English Language Learners (ELL), as well as anyone engaging in obtaining multilingual abilities, were found to have eight mental benefits. The main benefit a person gains when committing to learn English or any language is the ability to communicate with the language itself and create connections with a wider range of the world’s population. Before this study it was believed this change in brain functioning only occurred when students had obtained a high level of language ability in the new language, but this study revealed this change may occur at the earliest stages of language learning. Language learning showed an increase in memory capacities, this was especially strong in short-term memory. This is a huge benefit because it allows the brain to keep information in the brain for longer durations while thinking processes are activated. The article explains this keeps mental path ways “opened up” which allows a person to use “differing avenues for thought.” Language learning helps “exercise” the brain to keep it flexible and agile. A person also benefits from language learning by gaining increased problem-solving abilities in all of the following areas: abstract thinking skills, concept formation, creative hypothesis formulation, strengthened capacity to identify, understand and solve problems; the ability to focus on a task by filtering out distractions and extraneous information and an increase in multi-tasking ability. Language acquisition also benefits a person by creating a greater comprehension for how language works and is used. The study found individuals with multilingual communication were able to better read and interpret social situations, which improved their performance in social settings. The study reports that individuals who were multilingual had a decreased rate of 2 to 4 years in the development of age-related cognitive problems such as dementia. The culmination of all these advantages results in one last benefit: an increased ability in digital literacy. Because of these quickened mental abilities individuals which are multilingual have a noticeable ability to stay up to date with modern technologies. Reading about this benefit reminded me of this quote: “Our intelligence tends to produce technological and social change at a rate faster than our institutions and emotions can cope with…We therefore find ourselves continually trying to accommodate new realities within inappropriate existing institutions, and trying to think about those new realities in traditional but sometimes dangerously irrelevant terms.” (War: The Lethal Custom, p. 441). Clearly having increased mental agility due to language acquisition helps the average language learners better stay atop all of the technological and informational changes constantly evolving in today’s world. If you’re thinking of studying English as a second language, find out more about Business English Courses in Brighton. What do students like about studying in Brighton?